Rebekah Leach started brainstorming ideas for this website in June 2009. The basic outline of the current site launched in September 2013. We switched over to our Born to Fly brand at the beginning of 2018. The Born to Fly brand represents the best in aerial education and there are many layers of the program that support aerial teachers and aerial students worldwide. Here on our curriculum website, it is free to become a basic member. At this level, you can place a listing in a worldwide studio directory. While most of our members are in the United States, this site has a huge audience around the globe. During the past decade, we have been deligently working on documenting aerial moves through pictures, words and video. Many projects (more books, expanded video library, posters, etc) are currently underway as you read this. Here at this site, paying members gain access to a full Video Library that demonstrates the moves described in all the manuals and beyond. The videos and manuals are designed to go hand in hand to cover all the angles of your aerial curriculum. Our Born to Fly Teacher Training Program is also designed to go hand-in-hand with our curriculum. If you are looking for more information about teacher training, please visit our sister site: www.BornToFlyTeachers.com. As it stands currently, the Video Library (accessible to paying members) includes over 900 videos in the categories listed below. Each apparatus is conveniently broken into Levels 1-4: 1 = Beginning, 2=Beginning Intermediate, 3=Advanced Intermediate and 4=Advanced. 10+ videos of rigging workshops (Brett Copes), important videos on safety (example: Kamikaze Video), equipment, etc. We hope that you will find aerial happiness in this site. There is a lot of depth in teaching and learning the aerial arts, and we are here to help you dive deeper into both. 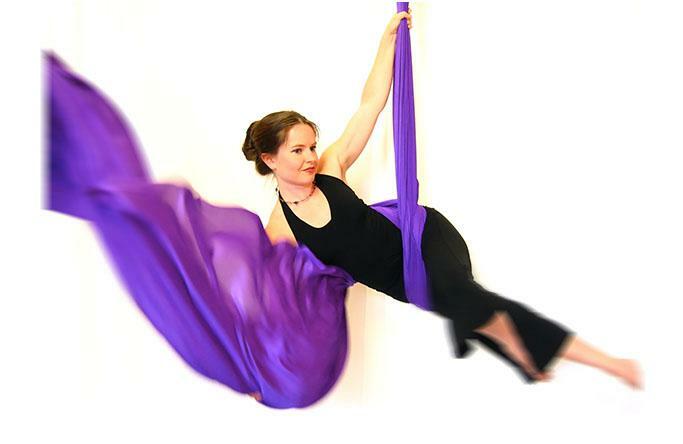 Rebekah Leach is an aerial dancer who is very passionate about creating aerial dance art, as well as teaching and promoting creativity in others. She has been teaching ever since she knew something to teach, and has been dancing ever since she could walk. Here's a small taste of the movement forms she has enjoyed studying at some point in her life: modern dance, ballet, tap, hip hop, breakdancing, yoga, ballet, Pilates, salsa, baton twirling, rhythmic gymnastics (specialty: ribbon), hula hooping, stunt-focused cheerleading, and even some pop 'n lock learned from street artists. Rebekah has taken advantage of all performing opportunities she could get her hands on since she had enough skills to put together a piece. She has performed everywhere from benefits with Grammy winners to symphony orchestras, to mega-church celebrations. She has also enjoyed many a tour with Aerial Experience Productions. She has also enjoyed working with Rina van de Kamp with the Daughter of Zion Aerial Dance Company in Santa Ynez, California, where she fell in love with the creative, collaborative process involved in putting together works of art. She appreciates work that evokes the whole range of human emotion, but her favorite is joy. Her choreography seeks to inspire and bring together a community. Rebekah has a background in many traditional dance styles, as well as some not-so-traditional, which come together in a unique blend to influence the way in which she approaches the aerial arts. After a long journey (which included years of Naval Service and journeys around the country), Rebekah and her family have settled down in Castle Rock, Colorado. We have opened a local studio which you can visit at www.AerialWorksCastleRock.com. If you are ever in the area, come by for a visit! Matthew is Rebekah's other half and a huge reason why Rebekah is able to do what she does. If you send an e-mail to info@aerialdancing.com, you are most likely to hear back from Matthew. While Rebekah creates the content, Matthew manages the content once it is made. He does all of the hard work of administration, bookkeeping, customer service, etc. He makes sure books are shipped out on time, everyone gets their downloads, etc. Matthew is a high school physics teacher, and the best dad in the world to two beautiful kids. Julianna Gaillard Hane, a native of South Carolina, traded life on a cotton farm to be a dancer and aerialist. Julianna holds a M.F.A. in Modern Dance from the University of Utah. During her graduate study Julianna founded Revolve Aerial Dance, a school and performing company specializing in aerial fabric, trapeze, and aerial hoop. Through the company she co-produced aerial concerts, performed in corporate events, and set an aerial dance work on the Snow College Dance Company in Ephraim, Utah. She wrote her master’s thesis on aerial dance choreography under the guidance of Donna White, Eric Handman, Abby Fiat and Tandy Beal. Her collaborations on AerialDancing.com include co-authoring the Aerial Hoop Manual Series with Rebekah Leach; she is helping to create sequences that will appear on the site in the near future; she runs the Remote Teacher Assessment Program (RTAP), and last but not least, she has helped launch a world-class teacher training program that uses Rebekah Leach's manuals as a basis for curriculum. 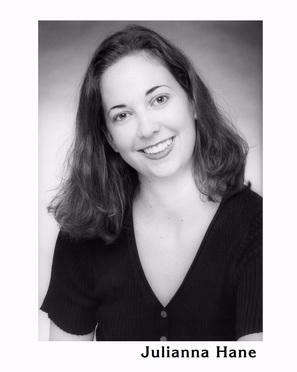 Julianna is the Director of Teacher Training at Born to Fly™ Productions. To learn more, visit www.BornToFlyTeachers.com.